Whilst users do everything they can to ensure they get the best air or liquid cooler that they can afford, one topic that seems to be forgotten about is thermal paste. It is the connecting link between the heat source and the cooler and it ensures a clean contact between the CPU or GPU and the cooler. Therefore, it is essential to use a good thermal paste if you want to help your high-end cooler work at its true potential. This is especially true if you call a water cooling your system. 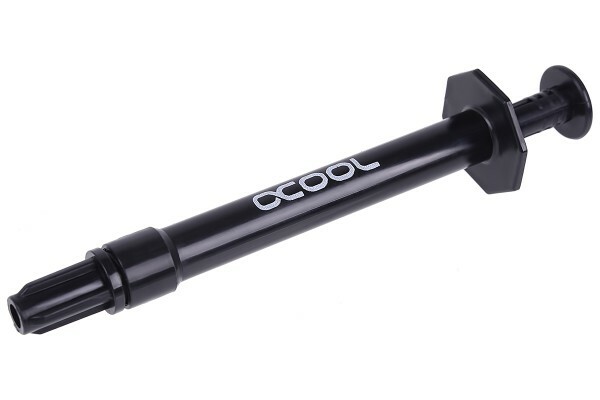 The Alphacool Eisfrost Xtreme is a high-performance liquid metal thermal paste. Conventional thermal pastes usually use silicone as a base and are often mixed with silver or similar metals to increase the cooling capacity. Nevertheless, the cooling capacity of a liquid metal thermal paste is many times higher. This is because the thermal conductivity of conventional thermal pastes is many times lower than that of Alphacool Eisfrost Xtreme liquid metal thermal paste. Thus, the heat is transferred much faster and more effectively from the processor or graphics card to the cooler. This is especially noticeable during overclocking. The higher the heat dissipation, the more the performance of the liquid metal becomes noticeable. In connection with a good air cooler, or even better a liquid cooler, you can achieve results that are several degrees Celsius better than with a conventional thermal paste. This converts into the chance to achieve a higher overclock and enabling you to squeeze out those extra Mhz from your CPU or the GPU. Alternatively, you can of course cool more quietly if you can achieve lower temperatures. Thus, the Eisfrost Xtreme is not only something for overclockers, but also for silent build lovers. Applying Alphacool Eisfrost Xtreme Liquid Metal Heat Conducting Paste is much easier than you think. First you should thoroughly pre-clean the heatspreader of the CPU or GPU as well as the cooler. This is best done with lint free cloth or kitchen towel. Afterwards you can do the basic cleaning with the enclosed cleaning cloth. You should avoid touching the heatspreader with your fingers after cleaning. The natural grease in your skin can make an application quite difficult. Now you can apply a small drop of the liquid metal in the middle of the CPU or GPU. This should be smaller than a pea. In the pack there are two special cotton sticks. This makes it easy to spread the Eisfrost Xtreme Heat Conducting Paste. Ensure you are patient and take your time here, due to the high surface tension of liquid metal it can only be spread slowly. Liquid metal is conductive. It is necessary to make sure that the liquid metal does not get onto any electronic components to avoid a short circuit. Liquid metal may only be used on the following metals: Copper, gold, silver, lead and zinc. This also includes nickel-plated copper as used by most coolers. Under no circumstances should it be used on aluminium surfaces, as liquid metal chemically reacts and can damage aluminium. Due to the high surface tension, the liquid metal may only be applied on a flat surface to prevent it from flowing away quickly. The liquid metal contains neither mercury nor toxic heavy metals such as lead. It is therefore non-toxic, non-flammable, non-explosive and does not form vapours. We can send you a safety data sheet by e-mail on request. Ich finde das Gesamtpaket sehr umfangreich. Paste, Spritze, Spachtel, sogar ein Ohrstäbchen ist dabei. Die Wärmeübertragung ist wie für Flüssigmetallpasten im Allgemeinen üblich sehr gut.